Membrane-associated guanylate kinase inverted 2 (MAGI-2) is a component of the slit diaphragm (SD) of glomerular podocytes. Here, we investigated the podocyte-specific function of MAGI-2 using newly generated podocyte-specific MAGI-2–knockout (MAGI-2–KO) mice. Compared with podocytes from wild-type mice, podocytes from MAGI-2–KO mice exhibited SD disruption, morphologic abnormalities of foot processes, and podocyte apoptosis leading to podocyte loss. These pathologic changes manifested as massive albuminuria by 8 weeks of age and glomerulosclerosis and significantly higher plasma creatinine levels at 12 weeks of age; all MAGI-2–KO mice died by 20 weeks of age. Loss of MAGI-2 in podocytes associated with decreased expression and nuclear translocation of dendrin, which is also a component of the SD complex. Dendrin translocates from the SD to the nucleus of injured podocytes, promoting apoptosis. Our coimmunoprecipitation and in vitro reconstitution studies showed that dendrin is phosphorylated by Fyn and dephosphorylated by PTP1B, and that Fyn-induced phosphorylation prevents Nedd4–2–mediated ubiquitination of dendrin. Under physiologic conditions in vivo, phosphorylated dendrin localized at the SDs; in the absence of MAGI-2, dephosphorylated dendrin accumulated in the nucleus. Furthermore, induction of experimental GN in rats led to the downregulation of MAGI-2 expression and the nuclear accumulation of dendrin in podocytes. 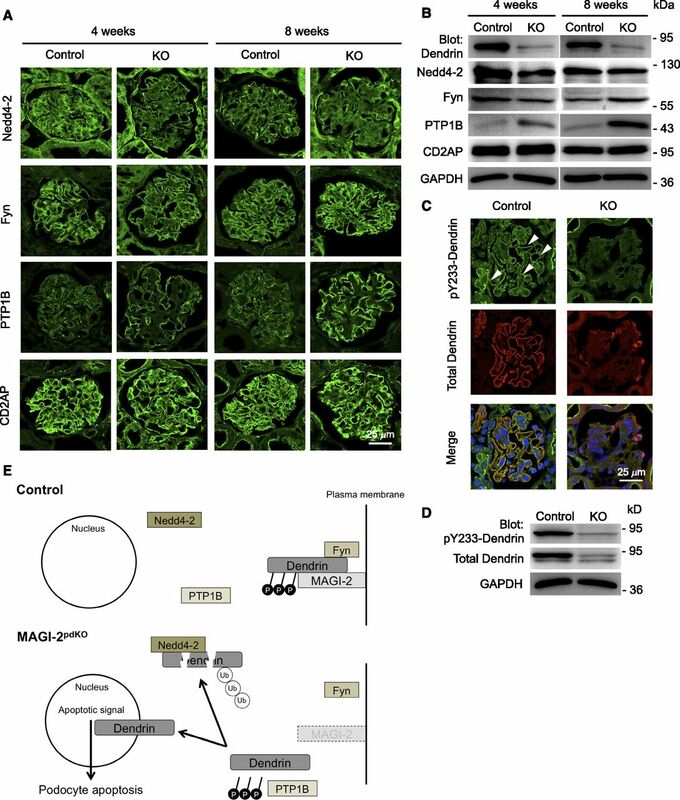 In summary, MAGI-2 and Fyn protect dendrin from Nedd4–2–mediated ubiquitination and from nuclear translocation, thereby maintaining the physiologic homeostasis of podocytes, and the lack of MAGI-2 in podocytes results in FSGS. Kidney podocytes surround the apical aspect of the glomerular basement membrane and form the final barrier to plasma proteins, which explains why podocyte injury is typically associated with proteinuria.1,2 In particular, the slit diaphragms (SDs), which ordinarily are observed as gaps between foot processes, play a crucial role in the filtering system. Despite remarkable advances in elucidating the details of the molecular architecture of podocytes and the SDs, the mechanisms underlying podocyte injury and loss are still poorly understood. Membrane-associated guanylate kinase inverted 2 (MAGI-2) is a multidomain scaffolding protein containing six PDZ domains, two WW domains, and a guanylate kinase (GK) domain. MAGI-2 was originally identified in the spine and in the podocytes.3,4 We previously reported that MAGI-2 whole-knockout (KO) mice exhibit a complete disappearance of SDs and die within 24 hours after birth because of anuria.5 Other groups have also recently reported the creation of MAGI-2 whole-KO mice.6,7 MAGI-2 has been identified as a novel target gene of Wilms Tumor 1 (WT-1).7,8 Podocyte-specific WT-1 KO mice also suffered from anuria leading to neonatal death, which is a phenotype similar to our MAGI-2 whole-KO mice.8 These reports suggested that MAGI-2 has a crucial role in SD homeostasis during the neonatal period. However, the podocyte-specific functions of MAGI-2 in adult mice remain unknown. To resolve this problem, we generated podocyte-specific MAGI-2 KO mice and performed phenotypic analyses in adulthood. Dendrin was also originally identified in the brain as a dendritic protein, the expression of which is differentially modulated by prolonged behavioral activity.9 Dendrin is seen as a component of the SD complex that translocates to the nucleus of injured podocytes in glomerular disease mouse models.10 Dendrin nuclear translocation promotes podocyte apoptosis, which leads to cell death.10 Dendrin nuclear translocation has also been detected in human glomerular diseases that can cause podocyte loss and glomerulosclerosis.11–13 Furthermore, we reported that the number of dendrin-positive nuclei in glomeruli might be a predictive factor in the disease progression of human chronic GN, IgA nephropathy.11 It was reported that genetic ablation of dendrin prolongs the life span by delaying the progression of kidney disease in mice.14 However, it remains unclear how the localization and expression of dendrin is controlled in podocytes under physiologic and pathologic conditions. Here, we show that MAGI-2 plays an important role in sequestering dendrin in the SD areas under physiologic conditions and that the lack of MAGI-2 results in FSGS. We also show that podocytes from crescentic GN exhibit MAGI-2 downregulation and dendrin nuclear translocation. To elucidate the role of MAGI-2 in adult mice, we generated podocyte-specific MAGI-2 KO (MAGI-2pdKO) mice (Supplemental Figure 1, A and B). The efficient depletion of MAGI-2 was confirmed via real-time PCR analysis of glomeruli (Figure 1A) and immunofluorescence (IF) studies (Figure 1B). MAGI-2pdKO mice were born in Mendelian ratios and appeared normal at birth, but the kidneys of MAGI-2pdKO mice at 12 weeks of age showed a pale appearance (Figure 1C). The median survival of MAGI-2pdKO mice was 90 days and all mice died by 20 weeks of age (Figure 1D). MAGI-2pdKO mice exhibit overt albuminuria and increased plasma creatinine levels. (A) The glomerular RNA from the control and MAGI-2pdKO mice was analyzed by real-time PCR. Expression of MAGI-2 was significantly decreased in the glomeruli of MAGI-2pdKO mice at 4 weeks of age. (B) Expression of MAGI-2 completely disappeared in MAGI-2pdKO mouse glomeruli analyzed by IF studies at 8 weeks of age. (C) At 12 weeks, MAGI-2pdKO mice exhibited atrophic kidneys. (D) Results from a 6-month follow-up of MAGI-2pdKO mice to establish the survival of the data. Kaplan–Meier survival curves showed that MAGI-2pdKO mice (n=16) had a significantly lower survival ratio than control mice (n=9) (P<0.001 by log-rank test). (E) Results from MAGI-2pdKO mice for urinary albumin-to-creatinine ratios. MAGI-2pdKO mice developed significantly higher levels of albuminuria compared with control mice from 8 weeks onward. (F) Blood chemistry analyses on mice at 12 weeks of age showed that MAGI-2pdKO mice had significantly higher plasma creatinine levels than control mice. Values are represented as the means±SEM (n=3–5). *P<0.05, **P<0.01, ***P<0.001 by paired t test. The levels of albuminuria in MAGI-2pdKO mice were significantly higher than that in control mice from 8 weeks onward (urinary albumin-to-creatinine ratios of control versus MAGI-2pdKO at 4 weeks: 0.01±0.01 versus 5.56±3.26; at 8 weeks: 0.02±0.01 versus 18.18±4.14, P<0.05; at 12 weeks: 0.02±0.00 versus 95.49±10.96, P<0.001; Figure 1E). MAGI-2pdKO mice exhibited significantly higher plasma creatinine levels compared with control mice at 12 weeks of age (plasma creatinine concentration of control versus MAGI-2pdKO at 4 weeks: 0.45±0.03 versus 0.39±0.02; at 8 weeks: 0.44±0.05 versus 0.45±0.03; at 12 weeks: 0.35±0.03 versus 1.38±0.21, P<0.01; Figure 1F). These results indicate that MAGI-2pdKO mice died because of renal failure. We performed periodic acid–Schiff staining in kidneys from MAGI-2pdKO mice and detected mesangial matrix expansion at 4 weeks, segmental glomerulosclerosis at 8 weeks, and global glomerulosclerosis at 12 weeks of age (Figure 2A). The glomerulosclerosis index in MAGI-2pdKO mice was significantly increased from 8 weeks onward (sclerotic glomeruli per total glomeruli of control versus MAGI-2pdKO at 4 weeks: 0.00±0.00 versus 0.80±0.46; at 8 weeks: 0.00±0.00 versus 9.73±2.81, P<0.05; at 12 weeks: 0.00±0.00 versus 87.88±7.96, P<0.001; Figure 2B). MAGI-2pdKO mice demonstrated interstitial fibrosis from 8 weeks onward (data not shown). These results indicate that MAGI-2pdKO mice exhibited FSGS-like glomerulopathy. MAGI-2pdKO mice exhibit glomerulosclerosis and an abnormal morphology of podocytes. (A) Pathologic analysis was performed by periodic acid–Schiff staining. Mesangial matrix expansion (at 4 weeks), segmental glomerulosclerosis (at 8 weeks), and global glomerulosclerosis (at 12 weeks) were observed in MAGI-2pdKO mice. (B) The glomerulosclerosis index was significantly increased in MAGI-2pdKO mice from 8 weeks onward. (C) Scanning electron micrographs of podocyte foot processes in control and MAGI-2pdKO mice. MAGI-2pdKO mice exhibited foot process regression at 4 weeks of age and foot process planarization at 8 weeks of age. (D) Microstructure of SDs of control and MAGI-2pdKO mice by transmission electron microscopy. (Upper panels) MAGI-2pdKO mice exhibited foot process effacement at 4 and 8 weeks of age. (Lower panels) SDs disappeared in MAGI-2pdKO mice at 4 and 8 weeks of age. Values are represented as the means±SEM (n=3–4). *P<0.05, ***P<0.001 by paired t test. To examine the mechanisms of renal dysfunction in MAGI-2pdKO mice, we performed morphologic analysis of the podocyte ultrastructure via scanning electron microscopy. Control mice showed normal foot process morphology featuring an interdigitating network, whereas MAGI-2pdKO mice exhibited a disorganization of interdigitation, a definite foot process regression at 4 weeks, and foot process planarization at 8 weeks of age (Figure 2C). Analysis of glomerular ultrastructure via transmission electron microscopy showed that the SDs between foot processes had disappeared in MAGI-2pdKO mice at 4 and 8 weeks of age (Figure 2D). These results indicate that MAGI-2 plays a crucial role in maintaining the structure of SDs. Injured podocytes undergo apoptosis leading to podocyte loss, resulting in glomerulosclerosis.15 To investigate whether podocyte loss occurred in MAGI-2pdKO mice, we counted the number of podocytes as well as WT-1 and DAPI double-positive cells in 50 nonsclerotic glomeruli. Podocyte loss was detected in MAGI-2pdKO mice, compared with control mice (WT-1–positive cell numbers in control versus MAGI-2pdKO at 4 weeks: 14.27±0.68 versus 10.01±1.02, P<0.05; at 8 weeks: 14.16±0.20 versus 7.34±1.52, P<0.05, each 50 glomeruli in n=3–4; Figure 3, A and B). Podocyte apoptosis increased in MAGI-2pdKO mice. (A) Mean podocyte numbers per glomerulus in control and MAGI-2pdKO mice at 4 weeks of age are shown for both DAPI-positive and WT-1–positive cells. (B) A significant decrease in the number of podocytes was detected in MAGI-2pdKO mice at 4 and 8 weeks of age. (C) The localization of cleaved caspase-3 (arrowhead) in control and MAGI-2pdKO mice at 4 weeks of age was investigated by immunostaining. (D) The rate of cleaved caspase-3–positive glomeruli per total glomeruli was significantly increased in MAGI-2pdKO mice at 4 and 8 weeks of age. (E) The TUNEL-positive dots were detected in MAGI-2pdKO mouse glomeruli. (F) The rate of TUNEL-positive dots per total glomeruli was significantly increased in MAGI-2pdKO mice at 8 weeks of age. Values are represented as means±SEM (n=3–4). *P<0.05, **P<0.01, ***P<0.001 by paired t test. Next, we performed an IF study of cleaved caspase-3 to detect apoptotic cells. The number of cleaved caspase-3–positive glomeruli was significantly higher in MAGI-2pdKO mice than in control mice (counted cleaved caspase-3–positive glomeruli/total glomeruli of control versus MAGI-2pdKO at 4 weeks: 0.60±0.30 versus 5.46±1.08%, P<0.05; at 8 weeks: 2.10±0.79 versus 15.39±1.94, P<0.01, each >50 glomeruli in n=3–4; Figure 3, C and D). The number of terminal deoxynucleotidyl transferase–mediated digoxigenin-deoxyuridine nick-end labeling (TUNEL)–positive cells in the glomeruli was significantly higher in MAGI-2pdKO mice at 8 weeks of age, compared with that in age-matched control mice (counted TUNEL-positive dots/total glomeruli of control versus MAGI-2pdKO at 4 weeks: 0.23±0.23 versus 1.17±0.56%; at 8 weeks: 0.00±0.00 versus 10.16±1.18, P<0.001, each >50 glomeruli in n=3–4; Figure 3, E and F). These results indicate that podocyte apoptosis was caused by the absence of MAGI-2. MAGI-2’s WW domains bind to dendrin’s PPXY motifs to prevent dendrin translocation to the nucleus. (A) Expression of dendrin and WT-1 by IF examination at 4 and 8 weeks of age. Dendrin was localized at the SDs in control mice but was translocated into nuclei in MAGI-2pdKO mice. (B) Dendrin from glomerular extracts (input) specifically interacted with GST–MAGI-2 but not with GST alone. (C) Endogenous MAGI-2 interacted with dendrin from isolated glomeruli. (D) Purified FLAG-dendrin but not FLAG-control bound directly to purified Myc–MAGI-2. (E) Schema of MAGI-2 and MAGI-2ΔWW. (F) GFP-dendrin coprecipitated with FLAG–MAGI-2 but not with FLAG–MAGI-2ΔWW. (G) Schema of dendrin full length, dendrinΔPPXY1, dendrinΔPPXY2+3, and dendrinΔPPXY1+2+3. (H) GFP-dendrinΔPPXY1+2+3 (lacking all three PPXY motifs) did not interact with FLAG–MAGI-2. (I) Nuclear translocation of GFP-dendrin was inhibited by FLAG–MAGI-2 but not by FLAG–MAGI-2ΔWW or FLAG-CD2AP. (J) Quantitative analysis of nuclear import of GFP-dendrin in transfected COS-7 cells. Values are represented as means±SEM (n=3–5). **P<0.01 by paired t test. Dendrin interacts with MAGI-2 in the brain.17 To test whether dendrin interacts with MAGI-2 in glomeruli, we performed a GST pull-down study. GST–MAGI-2, but not GST alone, specifically interacted with endogenous dendrin (Figure 4B). Next, to examine whether the dendrin–MAGI-2 interaction occurs endogenously in glomeruli, we performed an endogenous coimmunoprecipitation (Co-IP) assay by using anti-dendrin antibody. Anti-dendrin precipitated dendrin and coprecipitated MAGI-2 (Figure 4C). To explore the direct binding of dendrin to MAGI-2, we performed in vitro reconstitution studies with purified FLAG-dendrin and Myc–MAGI-2. Myc–MAGI-2 bound directly with FLAG-dendrin, but not with the FLAG-control (Figure 4D). To further map the sites of the dendrin–MAGI-2 interaction, we performed Co-IP studies in HEK293 cells cotransfected with truncated mutants of FLAG–MAGI-2 and GFP-dendrin. In contrast to FLAG–MAGI-2, FLAG–MAGI-2ΔWW did not interact with GFP-dendrin (Figure 4, E and F). GFP-dendrin, GFP-dendrinΔPPXY1, and GFP-dendrinΔPPXY2+3 coprecipitated with FLAG–MAGI-2 (Figure 4, G and H). In contrast, GFP-dendrinΔPPXY1+2+3 did not interact with FLAG–MAGI-2 (Figure 4, G and H). These results indicate that the WW domains of MAGI-2s bound with the PPXY motifs of dendrins. It was reported that CD2AP deficiency induced dendrin downregulation and promoted its nuclear translocation.18 We performed cotransfection studies in COS-7 cells to investigate whether MAGI-2 or CD2AP is necessary for inhibiting dendrin nuclear translocation. COS-7 cells express CD2AP endogenously, but not MAGI-2 or dendrin (Supplemental Figure 2). MAGI-2 suppressed dendrin nuclear translocation in MAGI-2 and dendrin cotransfected cells (nuclear dendrin-positive cells of GFP-dendrin and FLAG-control transfectant versus GFP-dendrin and FLAG–MAGI-2 transfectant: 100.0±0.00% versus 52.0±6.44%, P<0.05, assessed with 20 cells, n=3–5; Figure 4, I and J). Neither CD2AP nor MAGI-2ΔWW suppressed the nuclear translocation of dendrin (Figure 4, I and J). These results suggest that MAGI-2 is necessary for inhibiting dendrin nuclear translocation in vitro. To elucidate the nuclear translocation mechanism of dendrin in MAGI-2pdKO mice, we tried to identify additional interacting proteins of dendrin. We screened a human kidney cDNA library using a yeast two-hybrid system, in which full-length dendrin and NLS1-deleted dendrin were fused to the DNA binding domain of the GAL4 protein according to previously published protocols.19 We identified cDNA clones encoding for the Src family kinase Fyn and HECT–type E3 ubiquitin ligase Nedd4–2 as putative interacting proteins of dendrin. First, we performed Co-IP studies in HEK293 cells cotransfected with GFP-dendrin and a form of FLAG-Fyn (kinase-active [YF] or kinase-dead [KN]) to investigate whether Fyn phosphorylates and binds to dendrin.20 FLAG–Fyn YF phosphorylates and interacts with GFP-dendrin, whereas FLAG–Fyn KN induced no phosphorylation of dendrin and was less bound to the dendrin (Figure 5A). We then used Src kinase inhibitors (PP2 and SU6656) to analyze whether the Fyn-dendrin interaction is dependent on Fyn-mediated phosphorylation of dendrin. Both Src kinase inhibitors abrogated the Fyn-dendrin interaction and inhibited the phosphorylation of dendrin (Figure 5B). A previous study reported that c-Abl, a tyrosine kinase, phosphorylated the tyrosine residue of the PPXY motif of c-Jun.21 Therefore, we hypothesized that Fyn phosphorylates the tyrosine residue of dendrin PPXY motifs. To confirm this hypothesis, we examined the phosphorylation of PPXY motifs–deleted dendrin constructs that had been previously developed (Figure 4G).16 The deletion of dendrin PPXY motifs abolished the Fyn-dendrin interaction and inhibited the phosphorylation of dendrin (Figure 5C). To examine whether Fyn binds to dendrin directly, we performed in vitro reconstitution studies with purified FLAG-dendrin and Myc–Fyn YF. Myc–Fyn YF bound directly to FLAG-dendrin but not to the FLAG-control (Figure 5D). Furthermore, an endogenous Co-IP assay showed that endogenous Fyn interacted with dendrin in glomeruli (Figure 5E). These results indicate that Fyn phosphorylates the tyrosine residue of dendrin PPXY motifs, and that the phosphorylation is necessary for Fyn-dendrin direct interaction. Fyn binds to and phosphorylates dendrin. (A–C) HEK293 cells were transfected with the indicated plasmids and cell lysates were analyzed by Co-IP and western blotting. (A) GFP-dendrin coprecipitated mainly with FLAG–Fyn YF and was phosphorylated by it. (B) Phosphorylation and binding to FLAG–Fyn YF of GFP-dendrin was abolished by Src kinase inhibitors PP2 and SU6656. Cells were pretreated with 10 μM PP2 or 5 μM SU6656 for 60 minutes before Co-IP experiments. (C) The Fyn-mediated phosphorylation was decreased in GFP-dendrin deletion constructs lacking PPXY motifs. (D) Purified FLAG-dendrin but not FLAG-control bound directly to purified Myc–Fyn YF. (E) Endogenous Fyn interacted with dendrin from isolated glomeruli. We previously reported decreased expression of dendrin in podocytes in glomerular diseases, suggesting that dendrin is degraded by an unknown mechanism.11,12 The ubiquitin-proteasome system plays an important role in cellular homeostasis. We hypothesized that dendrin is bound to, and ubiquitinated by, Nedd4–2. First, in vitro reconstitution studies with purified FLAG-dendrin and Myc–Nedd4–2 showed that Myc–Nedd4–2 bound directly to FLAG-dendrin but not to the FLAG-control (Figure 6A). Further Co-IP studies showed that Myc–Nedd4–2 interacted with GFP-dendrin and this interaction was abrogated by deletion of dendrin’s PPXY motifs (Figure 6B). These results indicate that dendrin’s PPXY motifs are necessary for binding to Nedd4–2. Next, we tested whether dendrin was ubiquitinated by Nedd4–2. Ubiquitination of dendrin was induced by Nedd4–2 (WT), but not by a catalytically inactive form of Nedd4–2 (Nedd4–2 [CA]) (Figure 6C).22 DendrinΔPPXY1+2+3, which did not interact with Nedd4–2, was not ubiquitinated by Nedd4–2 (WT) (Figure 6C). These results indicate that Nedd4–2 interacts with dendrin’s PPXY motifs, resulting in poly-ubiquitination of dendrin. Fyn protects dendrin from ubiquitination-mediated degradation by Nedd4–2. (A) Purified FLAG-dendrin but not FLAG-control bound directly to purified Myc–Nedd4–2 (CA). (B–I) HEK293 cells were transfected with the indicated plasmids and cell lysates were analyzed by Co-IP and western blotting. (B) GFP–dendrin full length, ΔPPXY1, and ΔPPXY2+3 coprecipitated with Myc–Nedd4–2 (CA). In contrast, GFP-dendrinΔPPXY1+2+3 did not interact with Myc–Nedd4–2 (CA). (C) FLAG-dendrin was ubiquitinated by Myc–Nedd4–2 (WT) in a PPXY motif–dependent manner, whereas dendrin ubiquitination was attenuated by Myc–Nedd4–2 (CA). 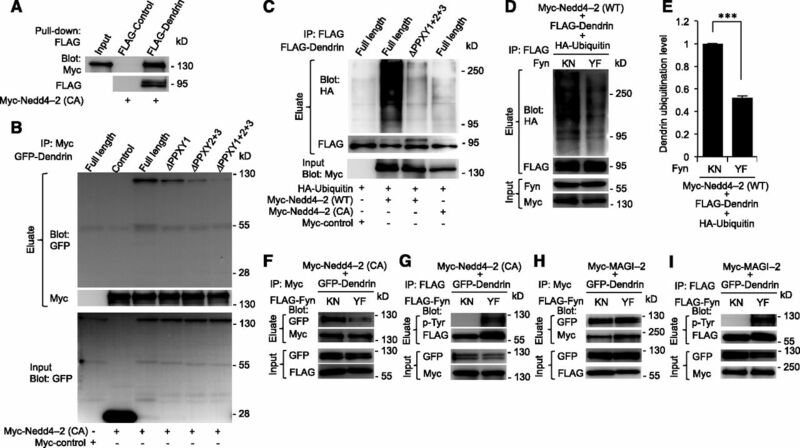 (D) Nedd4–2–mediated ubiquitination of FLAG-dendrin was decreased in the presence of Fyn YF. (E) Quantitative analysis of dendrin ubiquitination levels. (F and G) Interaction of Myc–Nedd4–2 with GFP-dendrin was decreased in the presence of FLAG–Fyn YF compared with FLAG–Fyn KN. (H and I) Interaction of Myc–MAGI-2 with GFP-dendrin was not affected by kinase activity of Fyn. Values are represented as means±SEM (n=4). ***P<0.001 by paired t test. Next, we hypothesized that the phosphorylation of dendrin regulates the Nedd4–2–dendrin interaction. We tested Nedd4–2–mediated ubiquitination of dendrin in the presence of Fyn, KN or YF. Nedd4–2–mediated ubiquitination of dendrin was significantly reduced in the presence of Fyn YF, by comparison with the presence of Fyn KN (Figure 6, D and E). These findings raise the possibility that Fyn-mediated tyrosine phosphorylation of dendrin’s PPXY motifs displaces dendrin from Nedd4–2. Our data supported this, showing that Myc–Nedd4–2 (CA) interacted more strongly with GFP-dendrin in the presence of FLAG–Fyn KN than in the presence of FLAG–Fyn YF (Figure 6F). The GFP-dendrin that coimmunoprecipitated with FLAG–Fyn YF was phosphorylated (Figure 6G). MAGI-2’s WW domains also interacted with dendrin’s PPXY motifs.17 These results prompted us to test whether the phosphorylation of dendrin by Fyn regulates the MAGI-2–dendrin interaction. Myc–MAGI-2 interacted with GFP-dendrin in the presence of FLAG–Fyn KN or YF (Figure 6H). Also, the GFP-dendrin that coimmunoprecipitated with FLAG–Fyn YF was phosphorylated (Figure 6I). These results indicate that phosphorylation of dendrin by Fyn can abrogate the Nedd4–2–dendrin interaction, but not the MAGI-2–dendrin interaction. We next analyzed how dendrin is dephosphorylated in podocytes. Protein tyrosine phosphatase 1B (PTP1B) is known to negatively regulate nephrin, an SD protein, via tyrosine phosphorylation mediated by Fyn.23 We studied whether PTP1B affects Fyn-mediated dendrin phosphorylation. When dendrin was coexpressed with Fyn, YF, and a catalytically inactive mutant of PTP1B (DA) in HEK293 cells, tyrosine phosphorylation of dendrin was detectable (Figure 7A). Fyn-mediated phosphorylation of dendrin was abolished by PTP1B (WT) (Figure 7A). PTP1B-mediated dephosphorylation of dendrin was cancelled by phosphatase inhibitor (PhosSTOP) (Figure 7A), suggesting that dephosphorylation of dendrin is dependent on PTP1B phosphatase activity. In addition, Nedd4–2–induced dendrin ubiquitination tended to be upregulated in the presence of PTP1B (WT) compared with PTP1B (DA) (Figure 7, B and C). Phosphatase inhibitor significantly abolished the PTP1B-mediated upregulation of dendrin ubiquitination (Figure 7, B and C). These results indicate that PTP1B contributes to dendrin dephosphorylation and Nedd4–2–induced dendrin ubiquitination. Next, we analyzed whether the PTP1B-dendrin interaction is direct or indirect. In vitro reconstitution studies with purified FLAG-dendrin and GST-PTP1B (WT) showed that GST-PTP1B (WT) did not bind to FLAG-dendrin (Supplemental Figure 3A). On the other hand, Co-IP studies showed that both GST-PTP1B (WT) and GST-PTP1B (DA) interacted with FLAG-dendrin (Supplemental Figure 3B), suggesting that PTP1B indirectly interacts with dendrin. PTP1B inhibits Fyn-induced dendrin phosphorylation and promotes Nedd4–2–induced dendrin ubiquitination. HEK293 cells were transfected with the indicated plasmids and cell lysates were analyzed by Co-IP and western blotting. (A) Phosphorylation of GFP-dendrin was completely abolished by GST-PTP1B (WT) but not by GST-PTP1B (DA). PTP1B-mediated dephosphorylation of dendrin was almost completely cancelled by PhosSTOP. PhosSTOP was added on the cell lysates during Co-IP experiments (1 tablet per 1 ml of lysis buffer). (B) Nedd4–2–induced dendrin ubiquitination was upregulated in the presence of PTP1B (WT) compared with PTP1B (DA) and abolished by PhosSTOP. (C) Quantitative analysis of dendrin ubiquitination levels. Values are represented as means±SEM (n=3). *P<0.05 by paired t test. Next, we analyzed whether Nedd4-2, Fyn, and PTP1B are expressed in glomeruli. IF and WB analyses showed that Nedd4–2 and Fyn are expressed in glomeruli of control and MAGI-2pdKO mice, and that dendrin was decreased and PTP1B was increased in glomeruli of MAGI-2pdKO mice (Figure 8, A and B). The localization and expression of CD2AP was preserved in MAGI-2pdKO mice, as in control mice (Figure 8, A and B). Dephosphorylated dendrin translocates to the podocyte nuclei in MAGI-2pdKO mice. (A) Expression of Nedd4–2, Fyn, PTP1B, and CD2AP by IF examination at 4 and 8 weeks of age. PTP1B was increased in MAGI-2pdKO mice. (B) Expression of dendrin, Nedd4–2, Fyn, PTP1B, CD2AP, and GAPDH by western blotting at 4 and 8 weeks of age. Dendrin was decreased in MAGI-2pdKO mice. PTP1B was increased in MAGI-2pdKO mice. (C) IF analysis of p233Y-dendrin and total dendrin at 4 weeks of age. Phosphorylated dendrin was localized at the SDs in control mice (arrowheads). Nuclear translocated dendrin was not phosphorylated in MAGI-2pdKO mice. (D) The glomerular lysates from control and MAGI-2pdKO mice at 4 weeks of age were analyzed by western blotting. Phosphorylated dendrin was clearly detected in control mice. (E) Postulated models for dendrin phosphorylation and nuclear translocation in podocytes of control and MAGI-2pdKO mice. P, phosphate; Ub, ubiquitin. To examine the localization and expression of phosphorylated dendrin, we produced anti–phospho-dendrin (pY233-dendrin) antibody. The antibody detected only phosphorylated dendrin by WB (Supplemental Figure 4). IF studies showed that pY233-dendrin was merged with total dendrin outside the nuclei in control mice, whereas anti–pY233-dendrin antibody could not detect nuclear translocated dendrin in MAGI-2pdKO mice (Figure 8C). WB studies detected pY233-dendrin and total dendrin in the glomeruli of control mice. Both pY233-dendrin and total dendrin were reduced in the glomeruli of MAGI-2pdKO mice (Figure 8D). These results suggest that cytosolic dendrin is dephosphorylated by PTP1B in the absence of MAGI-2, leading to ubiquitination by Nedd4–2 or translocation to the podocyte nucleus. Finally, we examined whether MAGI-2 decreases and dendrin relocates to the podocyte nucleus under pathologic conditions. Previously, we reported that dendrin relocates to the nucleus of podocytes in a mouse model of crescentic GN.10 We analyzed the localization and expression of MAGI-2 and dendrin in a rat model of GN that displays crescent formation and proteinuria.24 In crescentic GN, we found a downregulation of MAGI-2 and an accumulation of dendrin in the nucleus of podocytes at day 14 after disease induction (Figure 9A). WB analysis showed that the expression of MAGI-2 and dendrin was decreased in the glomeruli of rats after disease induction (Figure 9, A and B). These results suggested that downregulation of MAGI-2 promotes dendrin nuclear translocation in a crescentic GN model. Podocytes from crescentic GN exhibited MAGI-2 downregulation and dendrin nuclear translocation. (A) Expression of MAGI-2, Nedd4–2, Fyn, PTP1B, dendrin, and p233Y-dendrin by IF studies. The expression of MAGI-2, Fyn, and PTP1B was decreased in GBM-Ab nephrosis rats. Dendrin was localized at the SDs in control rats but was translocated into nuclei in GBM-Ab nephrosis rats. Phosphorylated dendrin was not detected in the nuclei in GBM-Ab nephrosis rats. (B) Expression of MAGI-2, dendrin, Nedd4–2, Fyn, PTP1B, and GAPDH by western blotting. MAGI-2, dendrin, Fyn, and PTP1B were decreased after anti-GBM antibody administration. GBM, glomerular basement membrane. 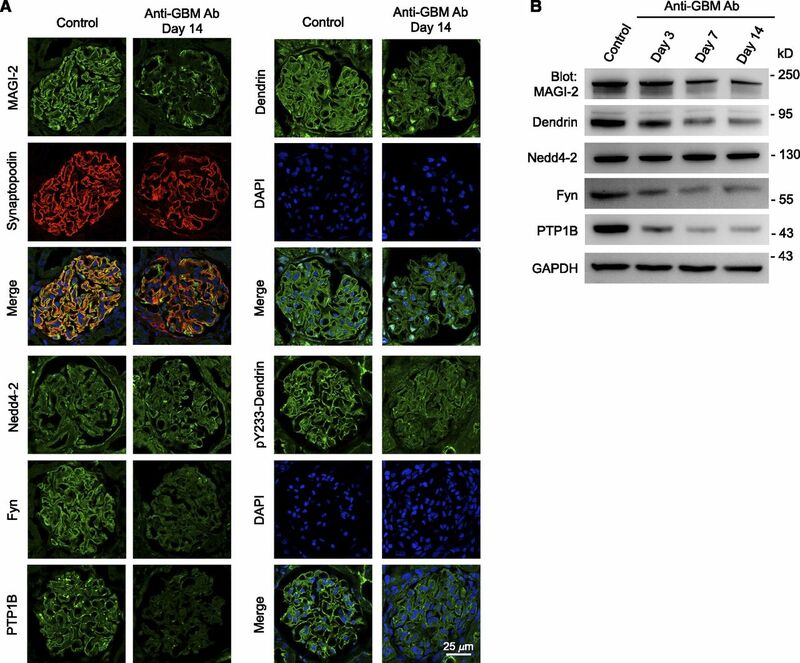 In addition, IF and WB analyses showed that Fyn and PTP1B was decreased and that Nedd4–2 was preserved in glomeruli of crescentic GN (Figure 9, A and B). Next, we analyzed whether dendrin is phosphorylated in pathologic conditions by using anti–pY233-dendrin antibody. Dendrin was phosphorylated in control rats (Figure 9A). In contrast, anti–pY233-dendrin antibody detected no nuclear translocated dendrin in crescentic GN (Figure 9A). These results suggest that dendrin is dephosphorylated and translocated to the nuclei not only in podocytes lacking MAGI-2 but also in podocytes of crescentic GN. In this study, MAGI-2pdKO mice exhibited massive albuminuria and glomerulosclerosis, and survived at least 2 months. On the other hand, our previously generated MAGI-2 whole-KO mice exhibited a complete disappearance of SDs and died within 24 hours after birth.5 We wondered why they showed different phenotypes. Similar previous reports indicated that the differences in phenotypes between podocyte-specific KO mice and whole-KO mice concerned giant protocadherins (FAT1), one of the components of the SD. 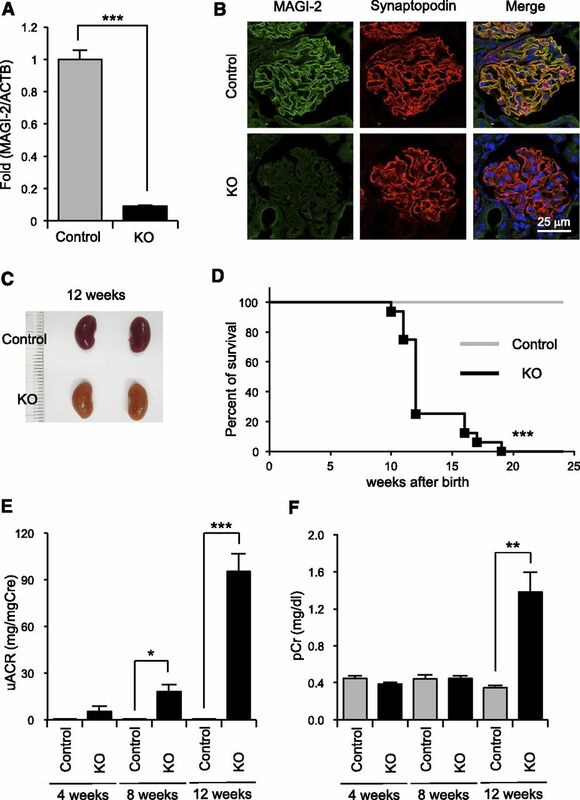 The podocyte-specific FAT1 KO mice exhibited massive albuminuria and survived to adulthood, whereas FAT1 whole-KO mice died within 48 hours after birth because of SD disruption.25,26 One possibility is the difference in MAGI-2 expression patterns in the neonatal period between MAGI-2pdKO mice and MAGI-2 whole-KO mice. Previous reports have shown that MAGI-2 appeared in the early capillary loop stage in the neonatal podocytes and that MAGI-2 was bound to a marker protein for the planar cell polarity pathway, Vangl2.4,27 Podocalyxin appears in the early capillary loop stage, and contributes to podocyte maturation by determining cell polarity.4 Of note, podocalyxin KO mice were also anuric and died in the neonatal period, as did MAGI-2 whole-KO mice.28 Cre recombination occurs during the capillary loop stage in glomerular development in Neph2-cre mice, suggesting that MAGI-2 disappears after the capillary loop stage in MAGI-2pdKO mice.29 Taken together, MAGI-2 expression in the early capillary loop stage may be necessary for determining cell polarity and podocyte maturation. Under physiologic conditions, dendrin binds to the SD-associated proteins nephrin and CD2AP in podocytes.10 Previous studies reported that nuclear translocated dendrin was observed in CD2AP-deficient podocytes, acting as a transcriptional factor to promote the expression of cytosolic cathepsin L and degradation of CD2AP by the cytosolic cathepsin L.18 Here, we revealed that nuclear translocated dendrin was clearly observed in MAGI-2–deficient podocytes as well as in CD2AP-deficient podocytes. However, MAGI-2, but not CD2AP, was sufficient to control the localization of dendrin outside the nucleus in vitro. Our studies suggested that the loss of MAGI-2 expression in podocytes induces nuclear translocation of dendrin, promoting podocyte apoptosis. It is possible that CD2AP indirectly regulates the interaction between MAGI-2 and dendrin. Future studies must elucidate the role of the MAGI-2–dendrin–CD2AP complex in SD homeostasis. Previous studies revealed that expression of dendrin was reduced in nephrotic animal models and human glomerular diseases, suggesting that dendrin is degraded for a reason.11–13 The ubiquitin-proteasome system is important in selective degradation.30,31 It was reported that mutant α-actinin-4 induces FSGS and undergoes ubiquitination and that RhoA was a target of Smurf1-mediated ubiquitination and Nck1 was a target of c-Cbl–mediated ubiquitination in podocytes.32–34 In this study, we identified a ubiquitin ligase, Nedd4–2, as a target of poly-ubiquitination for dendrin degradation in podocytes. The next question is, why dendrin is not degraded in podocytes under physiologic conditions. In our experiments, PPXY motifs of dendrin were phosphorylated by Fyn and the phosphorylation protected the Nedd4–2–mediated ubiquitination. In addition, endogenous Nedd4–2 did not interact with dendrin in glomeruli under physiologic conditions (Supplemental Figure 5). These results confirm that Nedd4–2 could not bind to dendrin because dendrin is phosphorylated under physiologic conditions. It is interesting that PPXY motifs of phosphorylated dendrin could bind to MAGI-2 WW domains, but not to Nedd4–2 WW domains. Thus, dendrin on the SD area may not encounter PTP1B, escaping dephosphorylation. Indeed, endogenous PTP1B did not bind to dendrin in glomeruli under physiologic conditions (Supplemental Figure 5). These findings suggest that dendrin phosphorylated by Fyn could form a complex with MAGI-2, nephrin, and CD2AP on the SD area under physiologic conditions. In this study, we demonstrated that MAGI-2 decreased in an experimental GN model. It was reported that reduced MAGI-2 expression is associated with glomerular diseases and that MAGI-2 mutations cause congenital nephrotic syndrome.7,35 These reports indicated that MAGI-2 plays an important role in the progression of human glomerular diseases. Newly generated MAGI-2pdKO KO mice would be an appropriate model to mimic nephrosis and FSGS, because they exhibited massive proteinuria, glomerulosclerosis, and kidney failure. Taking our studies into consideration, inhibition of dendrin nuclear translocation and/or preventing MAGI-2 from downregulation could be novel therapeutic targets against podocyte loss leading to kidney failure. In conclusion, we demonstrated that podocyte-specific MAGI-2 ablation causes podocyte loss and glomerulosclerosis, which results in kidney failure. MAGI-2 plays an important role in regulation of the localization and degradation of dendrin. Under physiologic conditions, Fyn phosphorylates dendrin and interacts with it. Under pathologic conditions, it is possible that dendrin with loss of MAGI-2 is dephosphorylated by PTP1B and the dephosphorylated dendrin is ubiquitinated by Nedd4–2 or translocated to podocyte nuclei, promoting podocyte apoptosis (Figure 8E). The Magi2 gene-targeting vector was constructed as follows: neomycin resistance cassettes flanked by FRT and loxP sites were inserted into introns 5 and 6, respectively. The Venus CDS was inserted into exon 6 (Supplemental Figure 1A). The linearized vector was electroporated into E14TG2a embryonic stem cells. G418 and FIAU (Moravek Biochemicals, Brea, CA) doubly resistant clones were screened by Southern blot analysis, and selected clones were used for the generation of chimeric mice. The chimeric males were crossed with CAG-flp transgenic female mice to delete the PGK-Neo cassette and to generate conditional (flox)-type KO mice, which lacked Magi2 exons 6–22. The care and use of mice in this study was approved by the Institutional Animal Care and Use Committee of Tohoku University. Neph2-cre mice were obtained from Prof. Lawrence B. Holzman (University of Pennsylvania).29 MAGI-2flox/flox mice were crossed with Neph2-cre (+); MAGI-2flox/+ mice to generate podocyte-specific Neph2-cre (+); MAGI-2flox/flox (MAGI-2pdKO) mice and Neph2-cre (−); MAGI-2flox/+ mice served as the control. The primers used for MAGI-2flox genotyping were forward (F1) 5′-AATAAAAATAGCTGCTTTGAGGACAGGGAG-3′, reverse (R1) 5′-GTCAAATAGAACCCACAGGGATGACAAAGA-3′, and reverse (R2) 5′-CATCGATTTTTTCCCAGCCATATGGAAGCT-3′. The primers used for Neph2-cre genotyping were forward 5′-TTTGCCTGCATTACCGGTCGATGCAAC-3′ and reverse 5′-TGCCCCTGTTTCACTATCCAGGTTACGGA-3′. Experimental crescentic GN was developed according to a protocol established by Kohda et al.24 Disease was induced in male WKY rats aged 5 weeks (body wt, 90–120 g) by injection of anti-rat mAb, a84 (Chondrex, Redmond, WA) (100 μg/kg, intraperitoneally). Rats (n=3 per group) were euthanized on days 3, 7, and 14 after injection of antibody and the kidneys were harvested. Saline-injected age-matched WKY rats (n=4) served as controls. Isolation of the wild-type and MAGI-2pdKO mouse glomeruli was performed using dynabeads perfusion methods.36 RNA of isolated glomeruli was isolated using RNeasy plus (QIAGEN, Venlo, The Netherlands), and then reverse transcribed using a ReverTra Ace qPCR RT kit (TOYOBO, Osaka, Japan). Real-time PCR was performed using a THUNDERBIRD Probe (TOYOBO) and a Real-Time PCR System 7300 (Applied Biosystems, Waltham, MA). The following primers were used: MAGI-2 (forward, 5′-CGAGAGCCATTTATGAAAGTAGGC-3′; reverse, 5′-GTTCCTTATAATCTGGACCAGAGGA-3′) normalized with β-actin. Plasma creatinine levels were measured using LabAssay Creatinine (Wako, Osaka, Japan) according to the manufacturer’s protocol. Urinary albumin was measured using a Mouse Albumin ELISA KIT (Shibayagi, Gunma, Japan) according to the manufacturer’s protocol. Kidneys were removed, cut, and fixed with 4% paraformaldehyde (PFA) in PBS at 4°C overnight. After dehydration, the kidneys were embedded in paraffin. Paraffin blocks were sectioned in 2 μm thicknesses, and stained with periodic acid–Schiff or with Azan Mallory for histologic evaluation by light microscopy. Kidneys were fixed with 4% PFA and 2% glutaraldehyde in 0.1 M phosphate buffer (PB; pH 7.4) at 4°C overnight. After postfixation with 1% OsO4 in 0.1 M PB for 2 hours, samples were dehydrated in ethanol and t-butyl alcohol and dried using a freeze-dry device. Next, the samples were coated with a thin layer of platinum palladium and examined with a scanning electron microscope (S-4700; Hitachi, Tokyo, Japan). Kidneys were fixed with 4% PFA and 2% glutaraldehyde with 0.1 M PB at 4°C overnight. After postfixation with 1% OsO4 in 0.1 M PB for 2 hours, samples were dehydrated in ethanol and propylene oxide. Next, the samples were penetrated in propylene oxide and Epon after polymerization in pure Epon. Ultrathin sections were cut with an ultramicrotome. The sections were stained in uranyl acetate and lead citrate. The grids were examined with a transmission electron microscope (H-7650; Hitachi). A full-length cDNA clone of human or rat dendrin was cloned in-frame into pEGFP-C1 (Clontech, Mountain View, CA) or pFLAG-CMV-6a (Sigma-Aldrich, St. Louis, MO) vectors. Rat dendrin deletion constructs lacking PPXY motifs 1 (amino acids 146–149), 2 and 3 (amino acids 170–179), or all three (amino acids 146–149, 170–179), were generated by PCR and cloned into pEGFP-C1 or pFLAG-CMV-6a. Mouse MAGI-2 cDNA was cloned into pGEX-5X-1 (GE Healthcare, Buckinghamshire, UK), pCMV-Myc (Clontech), or pFLAG-CMV-6a. A MAGI-2 deletion construct lacking the WW domain (amino acids 304–380) was generated by PCR and cloned into pFLAG-CMV-6a. Mouse CD2AP cDNA was cloned into pFLAG-CMV-5a. Human Fyn YF (kinase-active form) and KN (kinase-negative form) cDNA was provided by Dr. Yutaka Harita (University of Tokyo) and cloned into pFLAG-CMV-6a or pCMV-Myc.20 Myc-tagged mouse Nedd4–2 (WT and CA) cDNA was provided by Dr. Takeshi Imamura (Ehime University).22 HA-tagged ubiquitin construct was provided by Prof. Keiji Tanaka (Tokyo Metropolitan Institute of Medical Science).32 GST-tagged PTP1B (WT and DA) was provided by Prof. Tomoko Takano (McGill University).23 Empty vectors (pEGFP, pFLAG, and pCMV-Myc) were used as the negative control. All constructs were verified by DNA sequencing. Rabbit or guinea pig anti-dendrin antibody has been previously described.11,12,37 Other commercial primary antibodies were used as follows: rabbit anti–MAGI-2 antibody, mouse anti-FLAG antibody, rabbit anti-HA antibody, and mouse anti-GAPDH antibody (Sigma-Aldrich); rabbit anti-GFP antibody (MBL, Nagoya, Japan); mouse anti-phosphotyrosine antibody (Millipore, Darmstadt, Germany); rabbit anti-Fyn antibody (Atlas, Stockholm, Sweden); rabbit anti-Fyn antibody, rabbit anti–cleaved caspase-3 antibody, and rabbit anti–Nedd4–2 antibody (Cell Signaling, Danvers, MA); mouse anti-Myc antibody and rabbit anti–WT-1 antibody (Santa Cruz, Dallas, TX); rabbit anti-CD2AP antibody (Proteintech, Chicago, IL); mouse anti-PTP1B antibody (BD Biosciences, Franklin Lakes, NJ); rabbit anti-PTP1B antibody (RayBiotech, Norcross, GA); goat anti-GST antibody (GE Healthcare); and mouse anti-synaptopodin antibody (Progen, Heidelberg, Germany). PP2 and SU6656 were purchased from Santa Cruz. Rabbits were immunized with a keyhole limpet hemocyanin–conjugated peptide (single letter code, VAPPS[pY]EGPHRC) corresponding to the PPXY3-containing sequence of dendrin. The anti-serum was affinity-purified with the corresponding peptide linked to Ultralink (BIO-RAD, Hercules, CA) according to the manufacturer’s instructions. Yeast two-hybrid screening for dendrin-interacting proteins was performed as previously described.19 Full-length dendrin and a dendrin mutant with deleted NLS1 (ΔNLS1) were cloned into bait vector pGBKT7 (Clontech) to create a fusion protein with the GAL4 DNA binding domain and transformed into yeast strain Y2Hgold. Expression of dendrin full-length–GAL4 or dendrinΔNLS1-GAL4 fusion protein was verified by immunoblotting. Transformed Y2Hgold cells were mated with yeast strain Y187 (Clontech), which was pretransformed with a human kidney MATCHMAKER cDNA library fused to the GAL4 activation domain. Screening was performed according to the manufacturer’s protocol (MATCHMAKER two-hybrid system 3; Clontech). Prey plasmids were isolated, sequenced, and retransformed into Y2Hgold cells in combination with the dendrin full-length or dendrinΔNLS1 bait construct control plasmid (pGBKT7-Lamin; Clontech), or the empty bait vector pGBKT7 to exclude false positives. Endogenous Co-IP from isolated glomerular extracts was performed as previously described.10 Briefly, glomerular lysates were prepared in lysis buffer (1% NP-40, 20 mM HEPES [pH7.5], 150 mM NaCl, 100 mM potassium iodide) supplemented with protease inhibitor (Complete Mini; Roche Applied Science, Penzberg, Germany) and phosphatase inhibitor (PhosSTOP; Roche Applied Science). Glomerular extracts were incubated with protein-A agarose beads (Santa Cruz) and rabbit or guinea pig anti-dendrin antibody (1:50) under rotation overnight at 4°C. The beads were washed three times in lysis buffer. Bound proteins were eluted with 4× Laemmli buffer/2-mercaptoethanol. Elutes, along with glomeruli lysates, were analyzed by western blotting. Blots were probed with rabbit anti-dendrin (1:500), guinea pig anti-dendrin (1:250), anti–MAGI-2 (1:500), anti-Fyn (1:1000), anti–Nedd4–2 (1:1000), and rabbit anti-PTP1B (1:500) antibodies. GST pull-down studies with GST–MAGI-2 and glomerular protein extracts were performed as previously described.10 Briefly, glomerular lysates were prepared in lysis buffer supplemented with protease inhibitor (Complete Mini) and phosphatase inhibitor (PhosSTOP). GST-fusion MAGI-2 protein was expressed in E. coli BL21 and immobilized on GST-agarose beads (GE Healthcare). The beads were washed three times in assay buffer (1% Triton-X 100 in PBS), and glomerular lysates were added to the beads. Reactions were incubated under rotation for 90 minutes at 4°C, and the beads were washed three times in lysis buffer. Bound proteins were eluted with 4× Laemmli buffer/2-mercaptoethanol. Elutes, along with glomeruli lysates (serving as input), were analyzed by western blotting. Blots were probed with rabbit anti-dendrin (1:500) antibody. Pull-down assays with purified recombinant proteins were performed as previously described.10 Briefly, FLAG-dendrin was immobilized on anti-FLAG beads (Sigma-Aldrich). The beads were washed three times with IP buffer (1%–2% Triton-X, 150 mM NaCl, 50 mM Tris-HCl [pH 7.5]), and 1.25–1.5 μg of purified Myc–MAGI-2, Myc–Fyn YF, or Myc–Nedd4–2 (CA) in IP buffer was added to the beads. Reactions were incubated under rotation for 1 hour at 4°C, and the beads were washed three times in IP buffer. Proteins were eluted with 4× Laemmli buffer/2-mercaptoethanol and analyzed by western blotting. Blots were probed with anti–c-Myc (1:200), anti-FLAG (1:10,000), and anti-Fyn (1:1000) antibodies. GST-PTP1B was immobilized on GST-agarose beads. The beads were washed three times with IP buffer, and 2.5 μg of purified FLAG-dendrin in IP buffer was added to the beads. Reactions were incubated under rotation for 1 hour at 4°C, and the beads were washed three times in IP buffer. Proteins were eluted with 4× Laemmli buffer/2-mercaptoethanol and analyzed by western blotting. Blots were probed with anti-FLAG (1:10,000) and anti-GST (1:2000) antibodies. Co-IP and western blotting from transfected HEK293 cells were performed as previously described.19 Briefly, GFP-, FLAG-, c-Myc–, HA-, and GST-tagged cDNA constructs were transfected into HEK293 cells using FuGENE 6 (Promega, Madison, WI). After 48 hours, cells were lysed with IP buffer containing protease inhibitor (Complete Mini) with or without phosphatase inhibitor (PhosSTOP). Lysates were then incubated for 3 hours with anti-FLAG beads or anti–c-Myc beads (Wako). The beads were then washed five times with IP buffer to remove unbound proteins. Bound proteins were eluted with 4× Laemmli buffer/2-mercaptoethanol. Elutes, along with whole-cell lysates (serving as input), were analyzed by western blotting. Blots were probed with anti-FLAG (1:10,000), anti-GFP (1:1000), anti–p-Tyr (1:2500), anti-Fyn (1:1000), anti–c-Myc (1:200), anti-HA (1:2500), anti-GST (1:2000), and mouse anti-PTP1B (1:2500) antibodies. Isolation of control and MAGI-2pdKO mouse and rat glomeruli was performed by sieving methods. Glomerular lysates and COS-7 cellular lysates were prepared in CHAPS buffer and supplemented with protease inhibitor (Complete Mini) and phosphatase inhibitor (PhosSTOP), as previously described.19 Proteins were eluted with 4× Laemmli buffer/2-mercaptoethanol, then analyzed by western blotting. Blots were probed with anti–MAGI-2 (1:500), rabbit anti-dendrin (1:500), anti–Nedd4–2 (1:1000), anti-Fyn (1:1000), rabbit anti-PTP1B (1:500), anti-CD2AP (1:500), anti–p233Y-dendrin (1:200), and anti-GAPDH (1:10,000) antibodies. All data are expressed as mean±SEM. Two sets of data were compared using a paired t test. A P value <0.05 was considered statistically significant. None of the authors has a direct conflict of interest that is relevant to this study. Outside the contents of the study, K.A., K.M., T.N., and M.Y. have received research funding from Mitsubishi Tanabe Pharmaceutical Corporation. We thank Prof. Lawrence B. Holzman (University of Pennsylvania) for Neph2-cre mice, Dr. Yutaka Harita (University of Tokyo) for Fyn cDNA constructs, Prof. Takeshi Imamura (Ehime University) for Nedd4-2 cDNA constructs, Prof. Keiji Tanaka (Tokyo Metropolitan Institute of Medical Science) for ubiquitin construct, and Prof. Tomoko Takano (McGill University) for PTP1B cDNA constructs. We thank Ms. Chinatsu Toguchi, Ms. Chihiro Nakagawa, and Ms. Yuri Ogawa for their excellent technical assistance. We thank Mrs. Keiko Okamoto-Furuta and Mr. Haruyasu Kohda (Division of Electron Microscopic Study, Center for Anatomical Studies, Graduate School of Medicine, Kyoto University) for their skillful technical support with the electron microscopy. We thank Dr. Yurie Nakaya for kind support with the intellectual property. This work was supported in part by a Ministry of Education, Culture, Sports, Science and Technology of Japan Grant-in-Aid for Scientific Research, 26670431 (to K.A. ), 20380058, 23380055 (to K.N.) and 14J12268 (to K.Y.-N.). This article contains supplemental material online at http://jasn.asnjournals.org/lookup/suppl/doi:10.1681/ASN.2016121356/-/DCSupplemental.